Diabetes mellitus (DM) is an established risk factor for the development and progression of cardiovascular disease (CVD). The prevalence of coronary artery disease (CAD) has been estimated as high as 55% in the diabetic population. It has been shown that diabetes is a major independent risk factor for CVD after adjustment for risk factors such as age, hypertension, hypercholesterolemia, and tobacco abuse (1). Patients with diabetes appear to develop more severe CAD with a greater tendancy toward adverse events. The relative risk of myocardial infarction (MI) is 50% greater in diabetic men and 150% greater in diabetic women (2). Approximately 20% of patients who have undergone coronary artery bypass grafting (CABG) have DM (3). Thus, diabetic patients undergoing surgical coronary revascularization represent a large and complex patient population. In the past decade, advancements in both percutaneous coronary intervention (PCI), primarily the use of stents, and surgical techniques, such as off-pump CABG and the use of arterial grafts, have continued to improve methods of coronary revascularization. 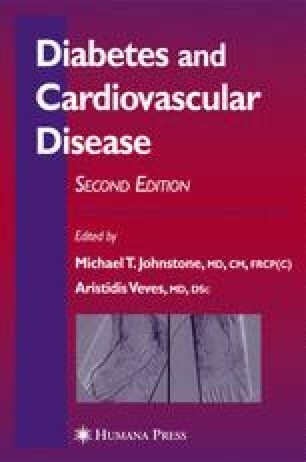 Although there is evidence to suggest these new techniques have improved outcomes in diabetic patients, the optimal treatment for multivessel CAD continues to evolve for the diabetic patient population, which despite improvements in revascularization still suffers from significantly worse outcomes when compared to the general population.